Sen. Rand Paul (R-KY) on Sunday said he does not believe proposed Republican healthcare legislation will pass through Congress. "I don't believe so. I think there's enough conservatives that do not want 'ObamaCare lite,' " Paul said on ABC's "This Week." 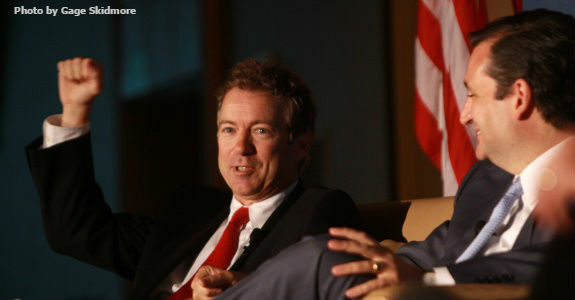 During the interview Paul advocated for a clean repeal of ObamaCare. “None of us ran on this plan. We ran on repealing ObamaCare because it doesn’t work,” Paul told ABC’s “This Week” according to Mallory Shelbourne of The Hill. “I was elected in 2010 right after it came into place, to repeal it,” Paul said of former President Barack Obama’s signature healthcare legislation. Conservative lawmakers have criticized the GOP measures for keeping certain components of ObamaCare in place. “We never ran on making the entitlement subsidies permanent,” Paul said according to Shelbourne. Senators Rand Paul and Ted Cruz are right, but the truth they are speaking has been largely drowned out by the lies coming from Speaker of the House Paul Ryan and his Big Government establishment Republican allies. Now here’s the kicker – President Trump and his team agree with Cruz and Paul. POLITICO reports that during a meeting at President Trump’s Mar-a-Lago estate in Florida Saturday, the president’s top advisers told three of the most vocal conservative opponents of the bill — Sens. Ted Cruz (R-Texas) and Mike Lee (R-Utah) and House Freedom Caucus Chairman Mark Meadows (R-N.C.) — that they agree with some of their concerns in principle, according to several sources familiar with the discussions. However, Speaker Ryan is more concerned with losing establishment Republican support than he is with producing a clean Obamacare repeal. POLITICO also reported House policy staffers worked through the weekend, haggling over several additional bill changes they believe could pick up another few moderate votes. Ryan announced one of those publicly Sunday: more generous health care tax credits for the “elderly,” a nod to centrist Republicans worried about the bill’s effect on people in their 50s and 60s. People in their 50s and 60s are hardly “elderly,” so this is more middleclass welfare instead of the kind of free market economics that would actually bring down costs. And it is all built upon the lie that Republicans have to put forth a “moderate” bill to pass the Senate, where Democrats can exercise the filibuster. Complete repeal of the Obamacare taxes and a fuller repeal of the law and its regulations are top expectations for conservatives, who want to tuck de-regulation provisions into a fast-tracked bill instead of passing legislation separately in the future, as is the current strategy. Establishment Republican leaders claim Senate rules require those changes to go through legislation that can be filibustered and so would need to win least eight Democratic votes, which seems unlikely. The answer is that the only parts of Obamacare establishment Republicans want to repeal are the parts in the current House bill, they are perfectly happy to keep the regulations and other Big Government parts of Obamacare and have no intention of establishing a free market health care and health care insurance system. Submitted by Tanaone on Wed, 03/22/2017 - 23:10. It appears that the Republicans must have agreed with this rotten legislation from the start, even though many of them ran, and won, campaigns by saying they would get rid of it should they be elected. I have an idea that if they were required to use it too, instead of the cushy plan they have set up for themselves, there would be an entirely different approach being taken by them now. It is maddening! In my humble opinion, no legislation should ever be passed if those pushing it exclude themselves from complying with it. Any damned fool knows that if something isn't good enough for the goose, it certainly can't be good for the gander either! The unmitigated nerve and in-your-face arrogance of these people is astounding and it is about time they be sent packing, back into obscurity where they can do no further damage to their fellow man. I am sure I won't be the first to wish them goodbye! !